Shaban Muhammad(infront) celebrating the third of his three goals against URA. 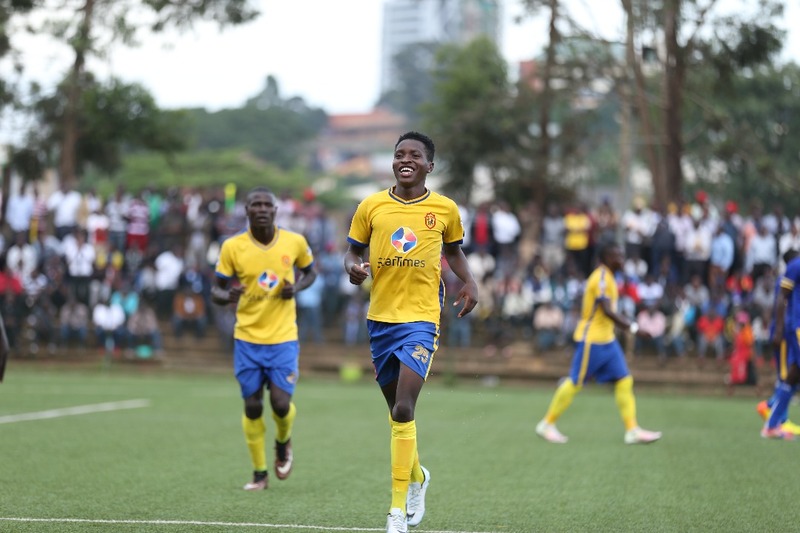 Muhammad Shaban was the star of the show as KCCA rediscovered their goal scoring touch, thrashing URA 7-2 at the StarTimes stadium in Lugogo. The striker netted hattrick on the day while Allan Okello and substitutes Paul Mucureezi and Patrick Kaddu scored the other goals. The first of the goals which was also initially thought to have been scored by Shaban was later confirmed as an own goal. URA’s consolation goals were scored by Jimmy Kulaba and Saidi Kyeyune coming in the first and second half respectively. The hosts started strongly with one attack after the other and it was to no surprise when they raced into an early lead. The deadlock was broken after nine minutes when URA defender Patrick Mbowa, under pressure from Shaban Muhammed diverted Julius Polotos delightful cross into his own net. 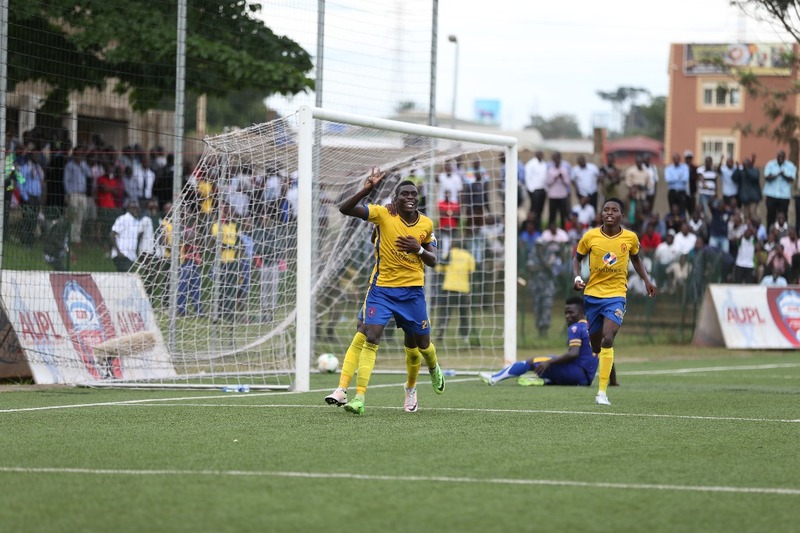 However, URA responded well with former KCCA striker Herman Wasswa forcing goalie Charles Lukwago to tip his curler over the bar for a corner which the hosts defended. After 25 minutes, Lukwago again denied Wasswa with a fine save off a well taken free kick but from the resultant corner,Jimmy Kulaba found himself unmarked in the area and headed powerfully to make it 1-1. The visitors should have taken the lead two minutes later but Wasswa wasted a glorious opportunity, failing to slot the ball into an empty net following great work by Shafic Kagimu and Kulaba, with the later flooring the KCCA goal keeper with his dragged low cross. With three minutes to half time, Shaban put the Kasasiro Boys back into the lead with an easy finish after goalie Mathias Muwanga parried Isaac Kirabira’s long-range shot into the striker’s path who sloted the ball into the net. Mike Mutebi made an immediate change at the start of the second half with Paul Mucureezi replacing the seemingly off-pitch Jackson Nunda. KCCA came out the better side and twelve minutes after the re-start, Shaban grabbed his second of the day with another easy finish thanks to Muwanga who again parried a long range shot into his (Shaban) path. A few minutes later, substitute Mucurezi made it 4-1, expertly diverting Shaban’s low cross past the dreadful Muwanga who was left scrambling on the wet Lugogo turf. Paul Nkata was forced to withdraw the calamitous Muwanga for Alionzi Nafian in goal and the former Onduparaka goalkeeper made some fine saves before he was breached in the 77th minute by Shaban after Kulaba slept on the job and let in the striker who grabbed his second hattrick for KCCA this season. URA scored their second of the day three minutes later when Saidi Kyeyune sent in a powerful low shot from outside the area and it went last the usually reliable Lukwago. With three minutes of normal time to play, another substitute Patrick Kaddu rose highest to node in powerfully a Allan Okello cross from the left. Okello who was arguably the best player on the pitch for 90 minutes finally got onto the score sheet, lashing onto a lose ball just inside the URA box and unleashing a fierce drive past Alionzi to make it 7-2 to KCCA. 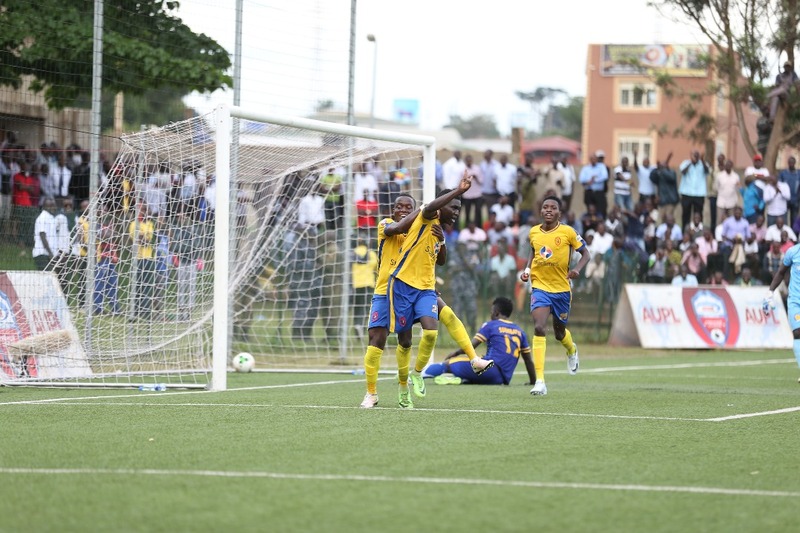 The scoreline is the biggest this season in the Azam Premier League and for KCCA, coming a few days after the Lugogo based side’s head coach Mike Mutebi had raised several concerns about his side’s poor goal scoring. The result keeps KCCA 3rd on the log with 48 points but have now trimmed the lead at the top to just a point. URA remains eight with 31 points but are only six points away from the relegation zone. KCCA FC will be back in action on Friday as they travel to Kitende to face top of the league Vipers SC in what is seen as a potential title decider.